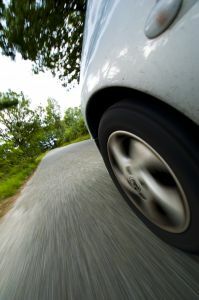 "Denver's Best Auto Repair and Quick Lube"
Today’s Express Car Care article discusses the effect of tire tread depth on braking. When we talk about stopping power, drivers tend to focus on brakes. But our tires are where the rubber meets the road. So having good brakes isn’t always enough. Every motorist has to have tires with enough traction to translate braking power into stopping power. Let’s focus on stopping in wet weather conditions. In order for a tire to have good contact with the road, it has to move the water out of the way. If it can’t move the water, the tire will actually ride on top of the thin film of water. This is called hydroplaning. We want our customers to know that if you hydroplane you won’t be able to stop as fast and if it’s really bad, you can actually spin out of control. So how does a tire move water? It has channels for water to flow through. Look at a tire and you’ll see channels that run around the tire and channels that flow across the tire. They’re designed to direct water away from the tire so it can contact the road better. These channels are called treads and the deeper the tread, the more water it can move. A brand new tire has very deep channels or tread and can easily move a lot of water. As the tire wears down, the tread becomes shallower and can move less water. When it wears down enough, it can seriously affect your ability to stop on wet roads. That is why it’s so important for drivers to replace the tires on their vehicles when they get worn. Consumer Reports and other advocate groups call for a standard of 3/32 of an inch and have studies to prove it. You might have seen the wear indicator that’s molded into tires. When tires are worn 3/32 of an inch, the tread wear bar is visible. So the recommended standard has twice the tread depth as a completely worn out tire. This little bit of added tread makes a big difference in your stopping power. If you’re curious about your tire tread depth, just insert a quarter into the tread. Put it in upside down. If the tread doesn’t cover George Washington’s hairline, it’s time to replace your tires. We’ve recommended this before only using a penny, but the times have changed and a penny shows only half of the suggested amount for tire tread depth. Give us a call of come in and see us if you have any more questions. Denver: Have You Considered Synthetic Oil?